Ages before video games or even Lego and Erector sets, children often entertained themselves with the toys of nature. In early autumn, a favorite was the Giant Puffball, a magical fungus that can reach massive proportions – in the world of fungi, at least. Specimens measuring six feet across and weighing more than 40 pounds have been found. 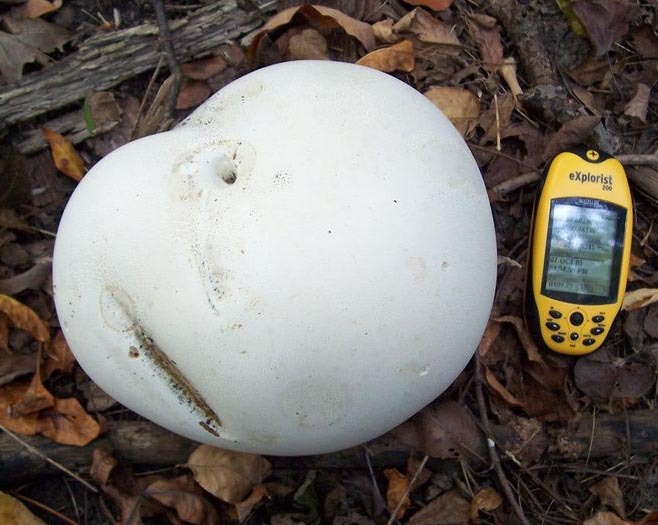 For a kid in the 18th or 19th Century, a big, white puffball sprouting in a pasture was just too tempting to ignore. Perhaps presaging their descendants’ interest in football and soccer, youngsters would invariably give the “ball” a good, swift kick. The reward was the namesake puff: A thick cloud of more than a trillion spores could burst from a ripe puffball. The kicker probably did the fungus a favor, for the spores are its seeds and the kick cast the fate of future generations to the wind. Odds of success for a microscopic spore are slim, however, for its chances of creating a new Giant Puffball are literally one in billions.